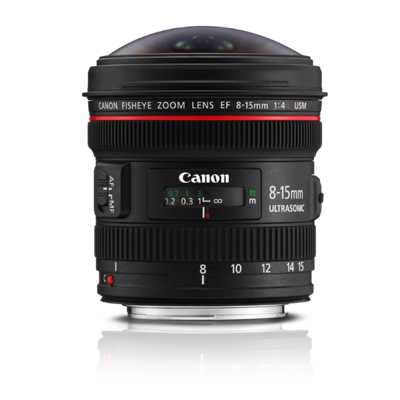 For filmmakers and photographers who want the look and feel only possible with extreme wide angle and fisheye photography, the new Canon EF 8-15mm f/4L Fisheye USM is a world-class choice. 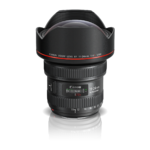 With its unique focal length range, the EF 8-15mm f/4L USM is the world's widest fisheye zoom lens. 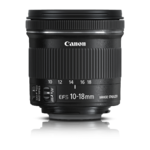 It delivers 180° diagonal angle of view images for all EOS SLR cameras with imaging formats ranging from full-frame to APS-C, and provides 180° circular fisheye images for full-frame EOS models. 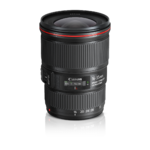 It features UD glass for suppression of chromatic aberration, a Sub wavelength coating for reduced ghosting, a newly developed Fluorine coating that keeps soiling, smears and fingerprints to a minimum, has full-time manual focus for instant switching from AF to Manual operation, and is built to the standards of the amazing Canon L-series of lenses. 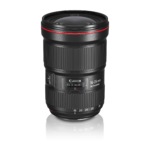 This means the finest optics, the best construction and the best performance available, all in a lens designed to stimulate creativity and deliver stunning images every time.